« Grrrr…Does Anyone Else Hate Candida?? Grapefruit Seed Extract – I’m Sold!! I’ve never been in to taking supplements for a variety of reasons. In the past week, however, my bias against supplements has begun to lessen. In my previous post, I mentioned I recently had a nasty die off reaction which promptly evolved into tonsillitis and further difficulty breathing (so fun). I wasn’t sure what to do or how to treat it. I just knew I didn’t want to visit my doctor who would take one look at my tonsils, whip out his prescription pad and tell me to take antibiotics for the next 10 days. No thank you! I talked to my Mom, who recommended I take Grapefruit Seed Extract (GSE). She spent about 30 minutes extolling the benefits of this extract and an hour later, I was shuffling into Whole Foods to purchase said miracle elixir *wink*. I faithfully took GSE 5 times a day and after 3 days my tonsillitis was nearly gone! I still had a few white patches on my tonsils but overall felt fine. It has now been 5 days and I’m so excited to report that I’m all better!! I’m honestly stunned at how well GSE worked to clear up my tonsillitis AND helped the pain in my lungs. I plan to continue taking GSE long term, as it is also a powerful antifungal. YAY for killing yeast!! Grapefruit seed-extract is used in humans to battle many types of internal and external infections caused from single and multi-celled parasites, fungi, viruses, and bacteria. The greatest benefit of grapefruit seed-extract is due to its multipurpose effect. Grapefruit seed-extract remains effective even if the cause of an infection is identified, misdiagnosed, or unknown. Grapefruit seed-extract naturally detoxifies, enhances and supports the immune system. Another important benefit of grapefruit seed-extract is that it alkalizes the blood. Alkalizing body fluids can be defined as raising the pH level. Raising the pH level is an important health regeneration benefit; because disease causing microforms, such as parasites, fungi, viruses, and bacteria cannot survive in an alkaline oxygenated environment. Grapefruit seed-extract is also claimed to be a natural alternative to strong antibiotics, without callous side effects. The greatest benefit of grapefruit seed extract is due to its broad spectrum anti pathogenic effect! Grapefruit seed extract remains effective even if the cause of an infection is known, misdiagnosed or unknown. Since we rarely know for sure the individual pathogen or mix of pathogens responsible for our infection. No other known compound can demonstrate such versatility. Grapefruit seed extract is mild in comparison to strong antibiotics that can destroy beneficial intestinal bacteria and deplete the immune system! Without these beneficial bacteria life could not be sustained. The beneficial bacteria can thrive much better after the harmful pathogens have been destroyed! CAUTION: ALWAYS DILUTE! Do not use full strength. Do not put in eyes. Avoid all contact with sensitive areas. May cause irritation if used full strength on skin. If full strength contact or irritation occurs, flush with water for at least 10 minutes. Irritation is temporary and may last up to 48 hours. KEEP OUT OF REACH OF CHILDREN. Internal Use: (Never use full strength) Orally. Adults, mix 1-5 drops of Maximum GSE into a glass of water or juice (5 oz. or more), 1-3 times daily, with or without meals. Children (5 years and older), 1-3 drops mixed into a glass of water or juice (5 oz. or more), 1-2 times daily, with or without meals. Do not use full strength in mouth. Throat Gargle. Stir 1 drop of Maximum GSE into a small glass of water (3 oz. or more). Gargle several times. Use as often as needed. Always dilute. Ear Rinse. Thoroughly mix 1 drop of Maximum GSE with 1 oz. of glycerin or alcohol. Apply 1-2 drops of this solution in affected ear 1-2 times daily. Use as often as needed. Do not use full strength in ears. Nasal Rinse. (adults only) Mix 1 drop of Maximum GSE with 6 oz. of water. Use one full eye dropper of the mixed solution per nostril. Tilt your head backward and release the solution from the dropper into your nose. Swing head forward and down (head is now upside down) to force solution up into the nasal passages. Return head to the normal upright position and allow nasal passages to drain. Do not inhale through the nose during this process. Always dilute. Vaginal Rinse. Mix 3-5 drops of Maximum GSE with 6-8 oz. of water. Douche once daily for one week or as directed by a healthcare professional. Always dilute. External Use: (Never use full strength) Facial Cleanser. Thoroughly moisten (splash) face with warm or cool water. With hands still wet, apply 2-3 drops of Maximum GSE to fingertips and gently massage facial area with circular motions. Rinse thoroughly with cool water and pat dry. A tingling sensation may follow. This is an indication of the deep cleansing properties of Maximum GSE. Always dilute. Skin Rinse. (minor skin irritations) Dilute 1-3 drops of Maximum GSE with 1 tablespoon of water. Apply this solution directly to affected area twice daily. Do not use full strength on skin. Nail Treatment. 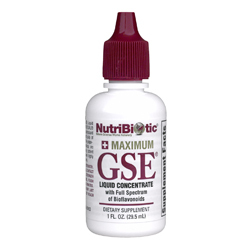 Dilute 1-3 drops of Maximum GSE with 1 tablespoon of water or alcohol. Apply this solution directly on surface of nail along the cuticle and underneath the front of nail, or soak nails, twice daily for as long as desired. Do not use full strength on nails. Scalp Treatment. Add 2-4 drops of Maximum GSE to each shampooing (mix in hand or on head with shampoo). Massage into scalp and leave on for at least 2 minutes. Rinse thoroughly with water. Toothbrush Cleaner. Stir 2-4 drops of Maximum GSE into a glass of water. Immerse toothbrush for 15 minutes (or leave in between uses). Rinse toothbrush before using. Change water and remix every few days. Vegetable/Fruit or Meat/Poultry Wash. Sink washing – Add 20 or more drops of Maximum GSE to a sink full of cold water. Briefly soak any vegetables, fruit, meat, or poultry. Rinse if desired. Spray washing – Add 10 or more drops of Maximum GSE to a 32 oz. pump sprayer bottle filled with water. Spray on any vegetables, fruit, meat, or poultry. Rinse if desired. Dish and Utensil Cleaning Additive. Add 10-20 drops of Maximum GSE to sink dishwashing water or to final rinse. Add 10-20 drops to automatic dishwasher with detergent or to final rinse. Cutting Board Cleaner. Apply 5-10 drops of Maximum GSE to cutting board and work into entire board with a wet sponge or dish cloth. Leave on for at least 30 minutes. Rinse with water. All Purpose Cleaner. Add 15-30 drops of Maximum GSE to any 32 oz. pump sprayer bottle filled with water or cleanser. Use on all surfaces around the house. I have not been compensated to review GSE.